Dryden Village Hall is located at 16 South Street, Dryden NY 13053; phone: 607-844-8122. Photo: Lacy-Van Fleet House, ca. 1845, 45 West Main Street, Dryden, NY. Listed on the National Register of Historic Places in 1984. Photographed by User:Doug Kerr (own work), 2010, [cc-by-2.0 (creativecommons.org/licenses/by/2.0)], via Wikimedia Commons, accessed July, 2013. Dryden is located in the northeastern section of Dryden Township, Tompkins County, New York. The area is marked by rolling hills accompanied by valleys formed by the many streams which eventually empty into Cayuga Lake to the west. The village of Dryden is picturesquely located in one of these valleys, and its many streams and surrounding hills serve as prominent visual features. These streams, along with the presence of stands of superior quality pine trees, were assets which made the Dryden township a logical location for a prospering lumbering industry in the early portion of the nineteenth century. Settled without a predetermined plan, Dryden village was given regular and precise guidelines for growth due to the roads which were at an early point cut along the boundaries of lots 38, 39, 48, and 49 of Dryden Township. The township had been surveyed as part of the Military Tract of New York State in the 1790's. Subsequent development occurred first along these crossroads leading north, south, east, and west. At the crossroads intersection there developed a commercial node still evident today in Dryden, with residential development occurring along the spurs leading into and away from the intersection. Two areas of the village were developed during the village's most prosperous years by the opening of new streets in the vicinity of the "four corners" intersection, forming the northwest and southeast quadrants of the village. The latter quadrant contains the historic district. Among the historic architectural resources of Dryden village, the Greek Revival and Italianate styles predominate and reflect the most prosperous periods of the village's development, although later Victorian and twentieth-century styles can also be found. 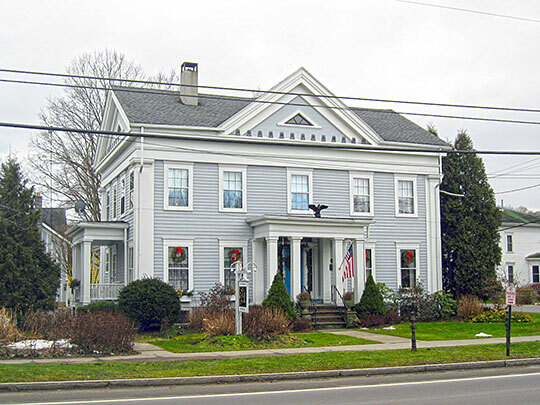 The Greek Revival style was employed primarily along the crossroads during Dryden's earliest prosperous period as a lumbering town (primarily the 1820's through the 1830's), as well as during its following period of industrial development (1840's and 1850's). The Civil War period and the years immediately following were also particularly prosperous ones for the village, during which time more elaborate and ambitious structures in the Italianate style were constructed in the 1860's and 1870's. Johnstone, Janette, New York State Division for Historic Preservation, Dryden Village Multiple Resource Area, nomination document, 1984, National Park Service, National Register of Historic Places, Washington, D.C.